The Training Tracker system has been designed for organisations to track and manage all company (internal and external) training requirements. The system is utilised by a wide range of small, medium and large businesses across all industry groups. 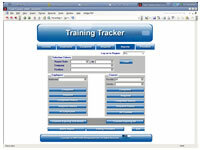 Training Tracker has assisted many of our clients to fully manage, control and organise the training requirements for all staff members throughout the organisation. Software can be further modified for your specific company requirements by our IT Programmers.